Coincidence or an attempt to revise the joke with better answers? As a drummer who will be rocking this evening, great entry!!! ALL OF THE ABOVE, and add USA too!!! Does that chicken look like Neil Young to anyone else? ‘Cause I’m thinking he’s definitely gonna be “Rocking the Free World” real soon. I’m from the ’50’s so it’s Around the Clock for me! The chicken looks a bit like Jimi Hendrix, actually. i have fashion show rehearsals tonight. 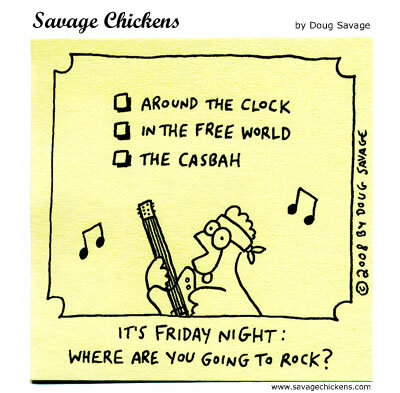 The Chicken actually looks like kermit the frog in a chicken suit, but for sure Rockin the Casbah! !